There’s nothing like being unorganized to ruin your quality BlackBerry time. What was originally thought to be some rare, uninterrupted (finally) one on one with your beloved smart phone has become a mad dash to get it organized. Your calendar doesn’t match your task list. Quick memos get lost in the shuffle. Dates for important conference calls are incorrect. You realize that when you swore a BlackBerry will help you become more efficient, that it wouldn’t do all of the work for you. As amazing as it is, it still needs you to be at the helm. Maybe you need to rethink your choice, maybe you need another device. NO! All you need is an app to keep you on the organized straight and properly filed narrow. Last week, the mProductive application rolled into the CrackBerry App Store; and was mentioned in the weekly app roundup. I wanted to take a look at it and see if it was willing to do, with the ToDo’s, it was made to do. Phew! mProductive is designed to minimize what some may see as unnecessary steps to maintain order. Will it ease your messy mobile clutter, or will it simply add to the pile? Let’s take a look. The mProductive application was developed by Basis Design Pty Ltd. In order to use mProductive, you must have a BlackBerry running OS 4.2 or higher; OS 6.0 is supported as well. You must also have the native memo and tasks apps installed (I don’t think I know of anyone who has removed these). Currently in version 1.7, the application has a file size of 602.8 KB. The application is available for $29.99 at the CrackBerry App Store, and has a 3 week trial period. The cost of the application was one of the main reasons why I wanted to take it for a test drive. I wanted to see if it was worth every penny. 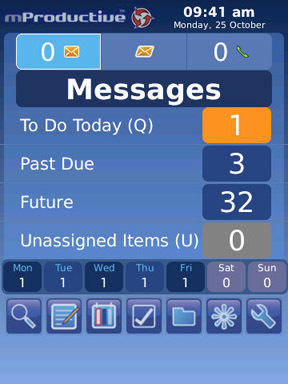 Calling itself the “Ultimate ToDo List”, mProductive does offer a clean layout and colour scheme. The calming blue hued app acts as the go-to for your ToDo’s. Rather than hopping in and out of your calendar, tasks, memos and such, everything is accessible from one place. At the top, it’s one click to Messages, SMS/MMS and Calls. Below this, mProductive points out what you have going on. This section divides all entries into what’s due today, past due, due in the future and unassigned. Below this, you can quickly review the week and see which days have items associated with it. At the bottom of the screen are quick links to Search, the mProductive Memo Pad, the This Week screen, Completed Items screen, Projects, Categories and Options. By default, it appears as though memos are shuffled into the Future category. Why? I don’t see any reason for it. Regardless, mProductive also groups entries by type; calendar entries, tasks, etc – making it easier to scroll through your ToDos. The application also allows you so search through, or filter items, by Project or Category. Next to each entry is an icon that is used to distinguish its status. The icons can be used to indicate the priority and/or progress of a particular entry. For example, you can see which tasks are currently in progress and which ones have been deferred. Clicking on an entry will redirect you to the native application (Memos, Task, etc), where you can review and manage items as usual. One feature I found amazing was the ability to link items. I can’t begin to count how many times I’ve had to look up information from multiple places – all for one topic. Projects become just that much more time consuming to complete. 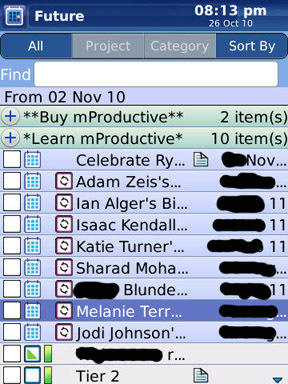 With mProductive, tasks, memos and calendar entries can be “linked” to a specific project or category. This is done under the To Do Today screen. Once assigned, users can easily see all of the associated items listed under the Project, or Category, in question. No more switching between apps, no more back tracking. Unfortunately, this also means no more excuses for not getting your work done. 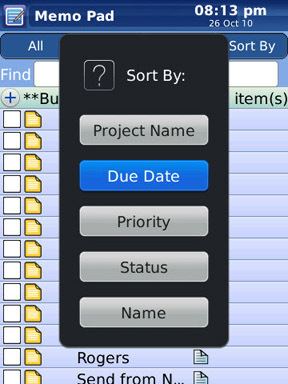 If you’re viewing the Projects under the To Do Today screen, any linked items lists can be hidden for quicker navigation. Another headache for some is creating reminders, or follow-ups, to emails or calls. I found that I could easily create a new calendar, task or memo entry from the email, sms or call. I could highlight a message, select mProductive – Assign To from the menu and voila. I’m redirected to the Assign To screen within the app. I can then assign the email address to a new or existing contact, or even assign the newly created task, calendar or memo entry to a category or project. This impressed me, as it makes updating projects, and keeping on top of reminders and new developments so much easier. Through the options menu you can automate the Assign To screen. That means an “Assign To” screen that sits too long will generate an unassigned item entry. This option can be applied to incoming and/or outgoing calls, sms or email. So even if you may forget to create an entry, mProductive will cover the basic entry. As powerful as mProductive is, I still can’t get my head wrapped around the price of it. True, it can be a critical tool for staying ahead, but I can already begin to imagine the comments regarding it. That issue aside, I found mProductive to be a solid partner and a welcome team member to any project. I did find that mProductive would not appear under the All screen on my Torch, only under Frequent and Downloads. 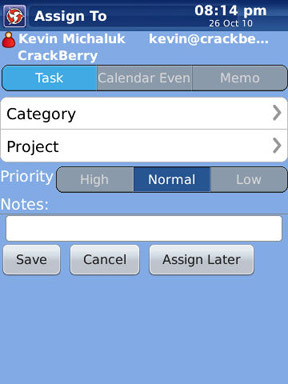 mProductive is available for $29.95 from the CrackBerry App Store and has a generous 21 day trial period available.